This clear wood sealer fills the grain, seals wood fibers, and levels the surface to ensure consistent finishes. The ideal pre-varnish treatment, it contains UV filters, and requires no sanding between coats. Use with 1-part polyurethane finishes. The goal of restoring a wooden boat, building a piece of wood furniture, or creating a wooden work of art is to make the wood itself look great, and make sure it stays that way for as long as possible—regardless of the type of wood, and whether it’s indoors or out. Especially if it’s outdoors, and the varnish finish will be exposed to sun, salt, and harsh weather. 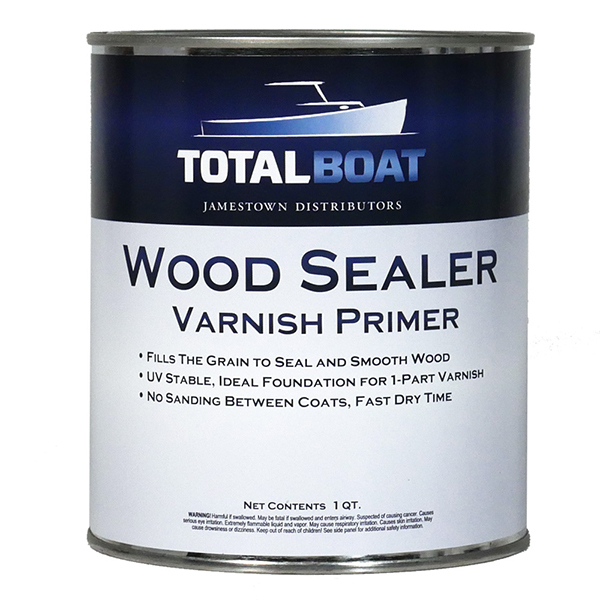 Make 1-part varnish finishes look better and last longer by coating new or bare wood with TotalBoat Wood Sealer first. It seals the wood fibers and fills the grain to smooth out the surface, removing highs and lows so varnish can be applied to a uniformly level surface, without thinning first. Because it dries clear, TotalBoat Wood Sealer won’t change the color of the varnish on top of it, or the wood beneath it. So bare wood’s natural beauty comes through. If the wood is stained, marine wood stains typically only fill the wood grain and change the color, but don’t seal the wood. So you still need to apply a sealer before finishing. TotalBoat Wood Sealer can seal in the color of stained wood without muddling, just be sure the stained surface is completely dry before applying the sealer, and do a small test first to ensure compatibility. Plywood is used in so many projects, from building decks to building docks. It’s very porous and is infamous for checking—those long, thin cracks running lengthwise in the wood grain. They’re caused because wood starts drying on the outside first. This creates tension, which can spawn lengthwise splits on the surface of a board, either on the flat face, the end, or internally. Plywood must be sealed before being varnished or painted to prevent checking and delamination of any finish coating. Sealing also primes the wood surface, which has two benefits. First, it prevents the finish coats of varnish or paint from sinking into the wood, which prevents you from paying more because you’d have to use more product. Second, this thin varnish primer also bonds to the wood and creates a level foundation for finish coats of varnish to bond to, so they don’t lift in large sections later. Keep in mind that because plywood is so porous, it may require 3 coats of TotalBoat Wood Sealer. In addition, oily hardwoods like teak and mahogany also need to be sealed to prevent their natural oils from lifting varnish or paint coatings. After properly preparing new or bare wood to remove any oil, grease, dust, or dirt, apply 2 coats of TotalBoat Wood Sealer to seal and level oily woods. The viscosity of varnish is such that it doesn’t penetrate wood grain easily. For that reason, varnish is usually thinned for the first couple of coats, and needs to be sanded between coats. On the other hand, TotalBoat Wood Sealer’s viscosity penetrates and seals wood more readily than thinned varnish, and does not require sanding between coats. It also dries faster than thinned varnish, so you won’t need to wait as long to start building finish coats. What’s more, the final coat of TotalBoat Wood Sealer is actually easier and faster to sand than thinned varnish, and because it dries more quickly, you’ll be ready to apply your finish coats of varnish sooner—which can save you a full project day. TotalBoat Wood Sealer is definitely not a pain in the arm like other clear marine wood sealers, because you don’t have to sand between coats. It has a viscosity that flows more easily into wood grain, and it dries faster, too, so recoating can happen in less than half the time. It also contains UV blockers that protect all the way down to the wood, which other marine sealers don’t do. Better still, with its longer open time, it won’t skin over and glob up in the can like other clear marine wood sealers do. Use it with either of the TotalBoat 1-part varnishes Lust or Gleam 2.0, which don’t require sanding between coats, either. Together, TotalBoat Wood Sealer and any TotalBoat 1-part varnish gives you a clear, level, beautiful finish in less time—every time.